Summer is well and truly over and the chilly winter winds and dark days are kicking in. Last year we experienced a long winter with the likes of the beast from the east, so if this year is similar, you will want to prepare your garage door. Many devices work a little less productively when it is cold or below freezing such as your car and mobile phone. Garage doors are no different with the most common time for a malfunction being during a period of extreme cold. Keeping your car in the garage is a smart thing to do in the winter months. There is no snow to clear off the vehicle and even if your garage isn’t heated your still out of that cold winter wind. Your garage door is the only thing separating your car or truck from the elements. So you want to make sure it’s in good shape for old man winter. There is not much worse than returning home, looking forward to getting inside in the warm after a tough drive in the snow, to find your garage door is not operating. This scenario can be easily prevented if you plan in advance and follow the below maintenance tips now before the weather gets progressively colder. Preparation is key this time of year. At Garage Door Rescue, we understand that this can be a very busy time of year with preparing for Christmas alongside the array of other things you have going on. Preparing your garage door for the cold is often not the top of everybody’s to-do list. So if you do not have time yourself, or If you would just rather leave your garage door maintenance in the hands of a professional, contact Garage Door Rescue today. Your local garage door specialists will be happy to carry out your winter garage door checks for you. Here at Garage Door Rescue, we have put together a guide to help you prepare your garage door for winter. If you follow all these tips, you will increase the chances of your garage door operating all winter long and prolong its overall life. 1. Observe – The first thing we recommend doing in preparation for winter, is to simply observe your garage door opening and closing a few times from the inside of your garage so you can see the cables, springs and rollers in action. You should be able to see or hear any problems, for example, is it moving smoothly or is it jerky in places? Does it operate silently or does it make grinding or scraping noises? Do both sides of the system (springs, pulleys and cables) look symmetrical? If you do notice a problem but cannot locate what is causing it, contact Garage Door Rescue over the phone and we can advise on the phone or come and visit. If you do not notice any issues with your garage door operation, it is still a good idea to carry out the rest of the steps below to ensure that no new problems occur over the course of the winter. 2. Clean – Not only does your garage door make a big part of the first impression of your home, but it also plays a big role in keeping your home secure. Just like your front door, your garage door is a way to access your property. Therefore, It is important to keep it in pristine operating condition all year round. Winter weather can be tough on your garage door so we recommend deep cleaning it now to avoid any blemishes being made worst. Wood doors will need to be checked for water damage and warp, as well as chipped and peeling paint. Steel doors may have rust spots that need to be sanded, primed and painted. It is a good idea to wash your garage door regularly with a mild all-purpose cleaner at the same time you do your car. While cleaning remembers to clean the tacks. As you use your door more and more, over time, debris can build on the track and rollers, which interferes with how easily it opens and closes. 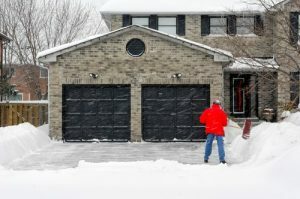 Eventually, your tracks may become so clogged that your garage door won’t open and close at all, which can be pretty inconvenient when temperatures reach those winter lows. 3. Lubricate – Once your garage door is clean it is a good idea to lubricate the moving metal parts. We actually recommend doing this twice a year or give us a call and we can lubricate your garage door for you. Lubricating your garage door regularly can add years of operation to its life. Use a specialised lubricant available from your local garage door specialist. Before applying the lubrication, make sure the tracks and other areas are cleared of debris and any gunk is wiped away. Then apply a thin layer of the lubricant on all moving parts of your garage door including the rollers, track, hinges, bushings, and overhead springs. These are the parts most likely to stick and stall when it’s cold outside, and the lubrication will help get those parts operating smoothly again. When you’re done, wipe away any excess oil to prevent additional build-up as this could clog and reduce the effects of lubrication. This task should only take about 10 minutes. For more information, visit our garage door lubrication blog or call us 01793 393503 for help. 4. Check The Mechanical Operation – Easily the most common problem to occur in winter with your garage door is the automation suddenly fails to open or close your door. We recommend opening and closing your garage door at least once a day to keep the system operation. Sadly there is no other way to ensure the mechanical operation lasts all winter long. If you do encounter a problem, the first thing to do is check the battery in your remote if it’s dead it will need replacing before the door will respond. If you’re satisfied that the remote is sufficiently powered, then this may suggest that there is a deeper problem, potentially with the motor, springs or tracks. In this case, it is always best to call in a professional to survey and repair the garage door properly. The team at Garage Door Rescue can quickly diagnose the problem. A problem could also be with the auto-reverse. We advise you test this function now so any budding issues can be fixed before the depths of winter. If you have an automated garage door, there is a legal requirement to have adequate sensors in place. At Garage Door Rescue, we provide a product called Roll-Smart which can be used to ensure your garage door is safe and in line with the law. To test your sensors are working, place a piece of wood or a brick on the ground in the path of the door. When the door coming down touches that object, it should reverse direction and go back up again. To test the beam sensors close your door and pass an object underneath in the door’s path. Your door should reverse. If the expected result does not happen, it is important that you call your local garage door specialist and get the problem fixed as soon as possible as your garage door will be a safety risk. 5. Check the Weather seal – If you have a weather seal strip on the bottom of your garage door, it is a good idea to check this before the weather takes a turn for the worst. Or if you do not have one, it could be worth having one installed. They are designed to help with insulation as well as protecting your garage door from the ground which might be wet or snowy. However, the weather seal can take quite a bashing so it is definitely worth checking it regularly and having it repaired or replaced if brittle or cracked. Cracked weather-stripping can allow snow and ice underneath the door and inside your garage, which will cause the door to free shut. To inspect the weather-stripping, wipe it down with a cloth, take note of any problem areas, and have an expert help with the repairs. As there are different types of rubber used for different door manufacturers, we suggest you call your local garage door professional to find the right type of rubber for your door. This should then last throughout the harsh winter weather we could face. 6. Check the Balance – If your garage door is not properly balanced, the garage door opener will need to work harder, and it won’t last as long. If your garage door is not balanced, then the fault is most likely to be with the spring. To tell if you need your springs replaced, take a few minutes and do a visual inspection of the garage door springs and cables. Check if the garage door is level with the floor in the closed position. If there is a noticeable problem, garage door spring adjustment is best left to the professionals. Call Garage Door Rescue today on 01793 393503. By using some of the tips above, your door should remain in good working condition throughout the winter. Most of these steps will only require a small amount of time. Following these steps every year before winter arrives so the life of your garage door is prolonged. As a homeowner, you have several routine maintenance tasks to keep your home a comfortable and relaxing place to live. Be sure to include garage door maintenance to that list. If you are unable to perform this task on your own, or just don’t have time to do it, call garage door rescue today. We offer all of these services and more if you’d rather have an experienced professional handle the job. Call us now on 01793 393503. Sarah Wirth works for Garage Door Rescue specialising in Marketing and Trend-Analysis.